5 Things To Do On Your Trip To Possum Kingdom Lake – Trinity Paddle Co. Ever wanted to learn more about Possum Kingdom Lake? Chances are that you’re the type who likes to get outdoors and away from the big city of DFW every once in awhile. However you may also want to avoid going someplace you don’t know that much about either. Well that’s why we’re here to help! In this article, we’re going to go over some of the activities you absolutely MUST do while you’re here. There’s plenty for a nice day trip, or for a couple of days of camping. What’s The Big Deal About Possum Kingdom Lake? Possum Kingdom Lake is its own state park that has a wide variety of outdoor activities for you to enjoy! In addition to the crystal clear blue waters, there’s also plenty of shores to fish from, trails to hike and bike around, and of course some wonderful places to boat and paddle board on. Beyond the two cliffs that stand before the area we paddle in is a cove where the waters are very calm. Many boats will also go inside this cove to tie up together and party! 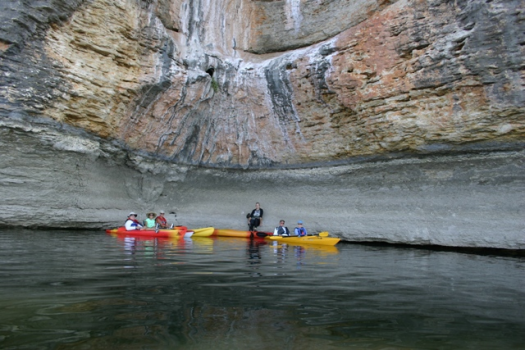 The lake is about 80 miles west of Fort Worth, and Hell’s Gate is one of the most easily accessible areas. Check out the video below to see an amazing drone video of the place! Boat, Jetski, Kayak, Or Paddle Board The Lake Of Course! The lake itself extends for over 65 miles! That means there’s plenty of room to do whatever water sport you choose from canoeing, kayaking, boating, or paddle boarding. Many kayakers will choose to kayak on the Brazos river itself, but many also kayak on the lake itself too. For boats, there’s several marinas in the area where you can dock and launch whatever type of boat you may use. Check out Bluff Creek Marina, the Harbor Marina, or Bonita Shores Marina for more info on how to prepare for your arrival. As far as safety, there’s no concern over dangerous wildlife at Hell’s Gate. Plus, it’s a no wake zone! Along with the calm waters, the cliffs bring plenty of chances to jump into the water too! Back in the day, some would jump right from Hell’s Gate! Nowadays though we must only jump from cliffs with a 25 ft maximum height. You can do this from the bluff over at the Harbor Marina! Because the lake is so big, there are a wide variety of camp sites to choose from. You can bring an RV, set up a tent, or sleep right under the stars by the lake’s shoreline. The Brazos River Authority has several of its own camp sites, and the State Park maintains campgrounds of its own as well. Sky Camp and Rock Creek Camp are another two that are private campsites. Check out this link to view more campsites and find information on how to book one. Now with everything we’ve just told you…..imagine the kinds of trails and fishing there is! You can fish for striped bass, catfish, and crappie amongst several others. Several areas will have a fishing pier and fish cleaning station too. Plus, you do not need a fishing license to fish from the shore in a state park. If you want to hike or bike, then the Possum Kingdom Trail will offer plenty of wildlife sightings, flora and fauna, as well as scenic views of the lake. However it will get hot in this area so prepare to bring plenty of water! There’s also snakes in the area too you should be aware of. This is where you need to go if you want to enjoy a restaurant, go shopping, or stay in a hotel room in the area. The Chaparral Grille at the Cliffs is a very popular spot to eat in the area, while the Harbor boast The Grille. We recommend visiting this link to see more info about both of these resorts and their amenities. We hope so! As you can see, there’s plenty to do and see here at the Lake no matter what you’re into. However we of course hope you’re going to join us for a paddle boarding adventure for at least one day. Give us a call at 817-799-8996 to reserve a rental, or use our website to book a reservation.